April has definitely been a month of really being in love with makeup and enjoying getting ready in bright spring daylight. It's basically felt like the scene in Narnia when the snow eventually melts and the sun comes out! I awake amazed it not cold or dark anymore. Which meant skincare went on the back burner some what - though I've still be obsessed with the Snowberry Instant Deep Cleanser which also featured in last months favourites and of course cleansing with a range of cream cleansers and my trusty Botanics Facial Brush. So here are the products that I've been absolutely loving in the month of April. 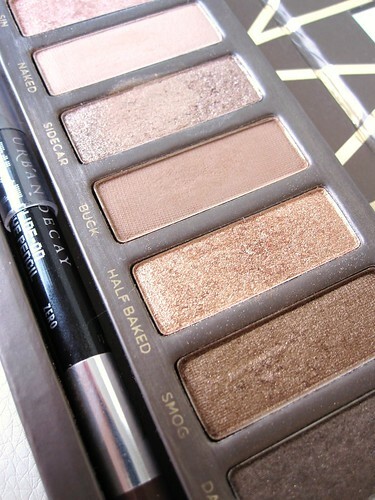 Urban Decay Naked Palette £32 - Available here! I've owned the rapidly becoming iconic palette for nearly 6 months now and still absolutely adore it and use quite afew of the eye shadows almost daily, which I think shows alot! I love eight out of the twelve shades in particular Naked (1 of the 2 matte eye shadows in the palette, just a lovely light chocolate milkshake shade), Smog (a beautiful shimmery rich golden brown) and Toasted (another rich metallic shade with a hint of pink and a light slate shade). All the eye shadows are a joy to use as they are so soft and buttery with minimal fall out, just such incredible quality. If you still want the palette and the link above to the Debenhams site is out of stock (which is quite likely) then really sign up to all the different stockists of the Naked palette to receive an e-mail once it comes back in stock. You really won't regret it, I promise! Oh how I was tempted to not include this as I know there are definite downsides to the product. However used in very small amounts this can be really nice. The downsides are the smell - it does have a bit of a funky scent to it, too much does come out of the tube and it can look harsh and un-even if you apply too much... I'm not painting a good picture am I! However that aside this is a really pretty iridescent highlighter that you only need such a small amount of just lightly on the tops of the cheek bones or brow bones. If you can get that right it looks great! So I am enjoying using it but it isn't without it's fault... think I will give it another week or so and then write a full review. High street foundations are definitely becoming more expensive which I am actually starting to except but now I 100% expect a good quality foundation for my money! This means it can't be cakey, it MUST last and most importantly it has to give a flawless look to the skin and this foundation definitely delivers on these points and more. Like it's name it is so weightless which is down to it being almost like a light gel/serum (ok, I just can't explain it) but you just need to pick up a tube of the foundation to feel how light the 30ml product is - basically it's like a cloud! This also applies so easily and blends like a dream to provide a light to pretty good coverage depending on how much you use. It doesn't cling to dry skin/dry blemishes nor is it too hydrating for oily skin it's just a good light formulation for summer... I just need to properly review it don't I?! This is also quite a good neutral toned foundation which I do see as quite a rarity for the high street - so nothing too pink or too yellow based making this shade a perfect shade for anyone with pale skin. However if you do want a more yellow based foundation to counteract any pink undertones in the skin then Max Factor's Second Skin Foundation is also an amazing foundation that I religiously used last winter! If you have ever purchased one of the little Bourjois Blusher pots then you will know how rubbish the little brush that comes with the product is, oddly shaped and scratchy (I must admit it is better than most 'with product' brushes though). So I've finally found a tiny brush that works perfectly with it without dusting the product everywhere which is what a normal sized blusher brush does! I actually got the Bare Escentuals brush free from a beauty counter in Selfridges, Trafford Centre with a small sample of a Bare Minerals foundation. So make sure to always keep your eye peeled for a cut out voucher in the fashion magazines as they do this offer afew times a year if I'm right in thinking. I've also found it actually picks up more of the baked mineral product than any other brush I've used with the Bourjois blushers, which I'm sure has something to do with the brush being for the Bare Escentuals mineral products so the brush fibres are more dense and therefore the blusher is more intense when applied which is only a good thing with the Bourjois pots as they aren't overly pigmented. Rambling aside the actual blusher is one of my favourites - it's fresh, it's pink and it's glowy so just perfect for summer and I personally love the rose scent to it! The only light matte bronzer I use from the high street (except for one from the Rimmel Sun range) as it is excellent quality and you get so much product for your money. Great as a light bronzer all over the face or just on the cheeks and it smells so good. It's also especially perfect for contouring with which leads me onto the Sigma F40 which fits perfectly under the cheekbones for fool-proof contouring and the brush is just so so soft and lovely to use. A great combination that I now use daily since the sun has been shining! When I spotted this last month in Boots I was almost sure it was new, but oh no no it has been around for years so my google search told me. I'm clearly not up on amazing topcoats am I?! This is just sooooooooo pretty over everything as the flecks literally glow an electric blue tone when they hit the light. The blue that only Opal stones have (and Jellyfish?) - just sooo beautiful! Though I must admit my up close picture doesn't show it off that well. If you love unique topcoats then this one is for you! I've spoken about this quite afew times to say the least but it is still a firm favourite that I'm sadly running very low on now! So as I'm probably starting to bore you all to death about the cleanser you can read my last rave about it here. I just now have to decide if I'm going to re-purchase this again as 15ml only does last a month or so and it's a pricey £23 but oh, how clear it makes my skin. I'm torn, what can I say! I've only just started using this again since last summer as this of course is a nice summery product and one that would feel abit odd to use in winter. Now I will admit it's not the most amazing product I've ever used but the scent is lovely, the jar is cute and it's getting me in the mood for summer. If it worth pointing out though that it isn't a lip gloss as it states on the jar, it's a lip balm that give a slightly glossy sheen to the lips like most balms do. Think this may just be knocked out of the water when I come across a really fruity/juicy lip balm this summer though. Never the less this is a really nice (more expensive feeling) lip balm for the price. Swatches of Glitz and Sassy in bottom right corner. It's official. I'm in love! I finally got around to purchasing more of the highly pigmented liquid-slash-mousse eyeshadow pots afew weeks ago and I'm more than pleased with my choices! I won't go into raptures just yet even though I easily could, but if you need raptures then read 25FLONDON's review here on the range as I'm almost sure she will convince you of the beauty of these with her images alone and ofcourse dupe conparisons. My own pictures above do make the shades look quite cool toned but I assure you that all the mousses are warm and so shimmery with ZERO fall out due to them being a mousse. Really cannot wait to write a full review on these plus the now discontinued blusher and bronzers from the same range. Just such an amazing range for the high street that I've used for a long time now and think easily match the quality of more high end products. Also been loving the Maybelline Drama Gel Liner, DHC Velvet Skin Coat and my treasured Space NK Tuberoli perfume! Can you tell I've been totally in love with makeup this month? !